Living Embryos: An Introduction to the Study of Animal Development covers the growth of an animal embryo, specifically the sequence developmental events of an egg. 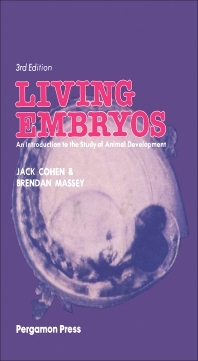 This book addresses the mammalian embryo as a homograph and demonstrates early vertebrate development mechanisms. Some of the topics covered in the book are the early embryology, development, and growth of the frog, mammals, chick, rabbit, arthropods, polychaetes, nematodes, molluscs, and tunicates. Other chapters deal with the formation of the nervous, muscular, and alimentary systems. These topics are followed by the analysis of the development of fishes. The discussion then shifts to the method of fertilization. The last chapters examine the formation of cleavage, cleavage geometry, embryonic membranes, and organization of the egg. The book can provide useful information to embryologists, biologists, students, and researchers.